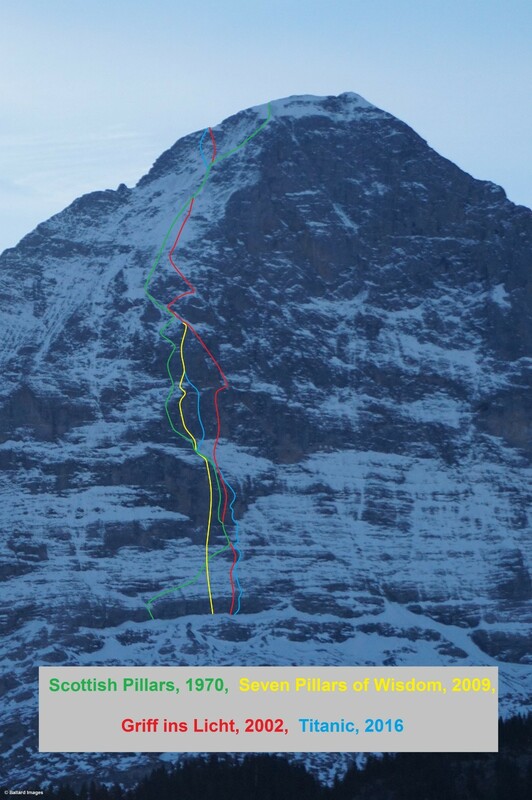 The North Face of the Eiger (3970m) has a new hard route after a seven-day effort by Tom Ballard and Marcin Tomaszewksi. From November 30 to December 6, the two men established Titanic (M5 5.10c A3 WI4, 1800m) on the left side of the north face. "Titanic is the third new route I've done with Tom but we've known each other for only six months," said Tomaszewksi. The 41-year-old Polish climber met the 28-year-old British alpinist in 2015, when Tomaszewksi attended an award ceremony in Val Gardena, in the Italian Dolomites, near where Ballard lived. "Our first climb together was a rather short 6b [5.10] route on the Mondello face in the Dolomites and we'd sent it a few hours before the award ceremony in Val Gardena," Tomaszewksi said. "I was one of the nominees for Karl Unterkircher Award for the new route I'd established on the Trollveggen Wall with Marek Reganowicz in 2015. 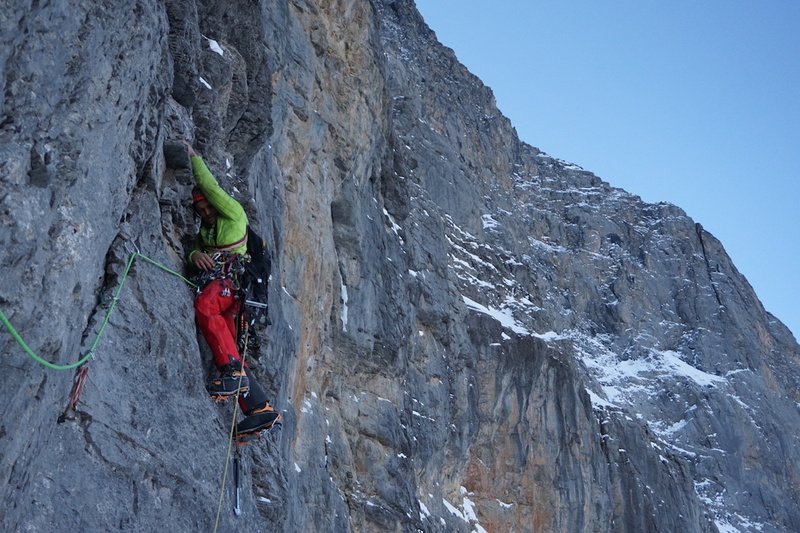 The second new route was the one on the north face of Monte Civetta in the Dolomites. 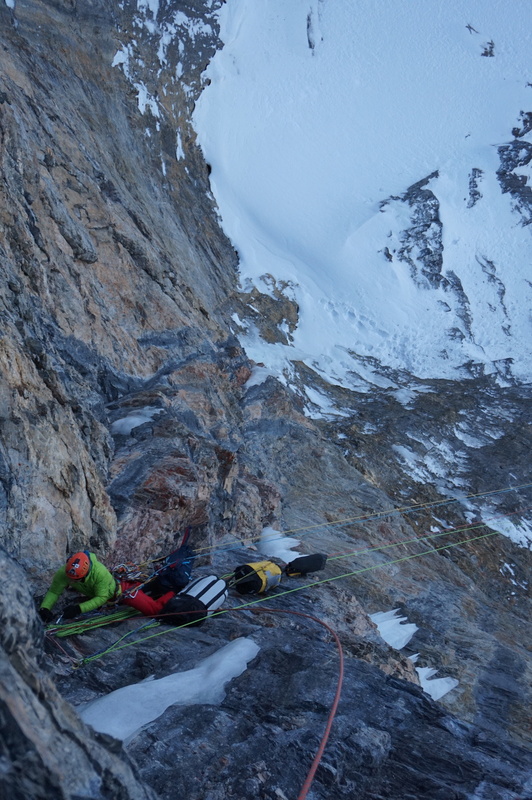 We climbed for two days and opened a line called Dirty Harry (5.10d, 1375m). 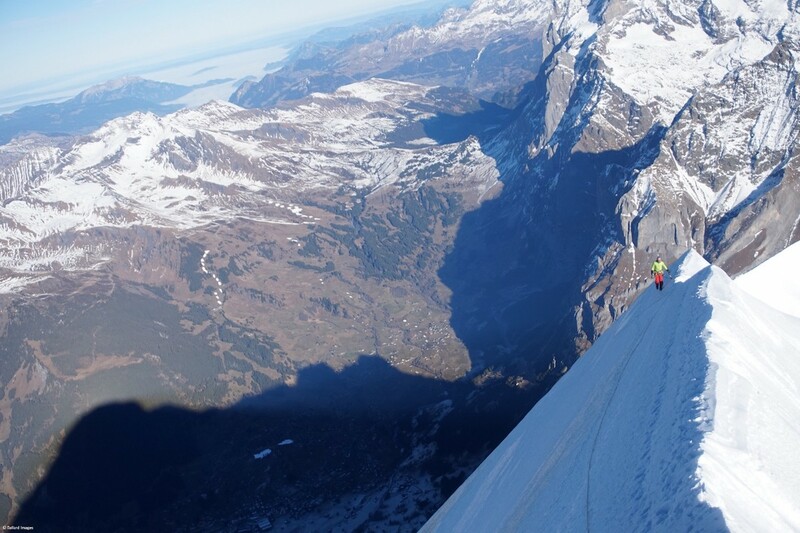 In November I sent Tom a...message asking whether he'd like to establish a new route on the North Face of the Eiger. At the end of November we met up in Interlaken, Switzerland, and seven climbing days later Titanic came true. "Titanic is a beautifully exposed route that leads through three chossy rock barriers," Tomaszewksi continued. "Because of the poor quality of the rock, many times we were forced to apply some aid techniques. The terrain we encountered in some parts of the wall was not good enough to place traditional protection. There were pitches where I needed to hammer a dozen Birdbeaks in a row. Despite the difficulties, climbing was going smoothly and without any disruption. The Eiger has a special significance for me as in the past it made me go through some unpleasant experiences, and therefore, I believe that having sent that route, I can finally say I got even with the Eiger. We were lucky with the weather that remained favorable just as the conditions on the wall. 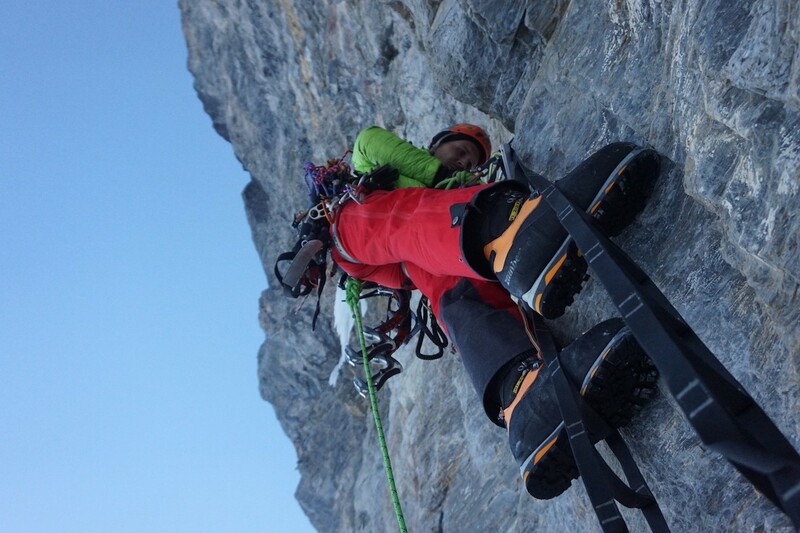 Plus, Tom knows that part of the wall pretty well from his previous summer ascents." Ballard has a special relationship with the Eiger that plays into how Titanic came to be. "The Eiger is like another family member!" he said. "My 'experience' started before I was born, [when] my mum [Alison Hargreaves] climbed the '1938' [Heckmair Route (ED: 5.8- 70-degrees, 1800m)] in 1988 whilst six months pregnant with me! In summer 1993 she soloed the Lauper Route [TD: 5.7, 1800m] as part of her Six North Faces project [to climb the six great north faces of the Alps alone, in one season. I was with my father and sister waiting down in Grindelwald. In January 2009, my father, sister and I packed our house into storage and drove to Switzerland. My plan was to repeat the Scottish Pillar [ED: 5.10- A3, 1800m], but it was foiled by a record snowfall winter. We camped in Grindelwald as the snow fell in truckloads. At the end of the winter we moved closer to the 'Face' in a small collection of Alpine Farm, Alpiglen. Here we lived in a 'barn' for twelve months! Being nearer I could get to grips properly with the route. Whilst cleaning and replacing the old gear, in preparation for a free ascent (which I made in the summer when the rock had dried out) I started to climb my very own route, Seven Pillars of Wisdom [ED: 5.12b, 1055m]. At the end of April 2013 my sister and I climbed the West Flank to the summit, then we descended, me on my skis, whilst she slid down on her snowboard, becoming the first woman to do so. Two months later I soloed the Lauper Route, in the best conditions this route had been in for 10 years. (The upper part of the route, the 'Lauperschild' is renowned for bad snow conditions, either soft and powdery or bare and brittle ice.)" Ballard said that during his repeat and subsequent first free ascent of the Scottish Pillar in 2009 he realized there were inconsistencies with the way the established routes were drawn among "all the published topos in books [and] on the Web—especially the one published [in a 2003 web article] by Alpinist*." That's when he looked to make a direct route up the three pillars in their entirety, creating Seven Pillars of Wisdom. "Then I realized there was still space [for another route]," he said. "I intended to take advantage of this, even buying a portaledge, but couldn't then find enough support...so [I] moved on.... At the end of September Marcin asked me about a new route on the Eiger. He had seen a space on the right hand side of the face, but I know that that line is not a feasible 'winter' objective because the rock is too smooth, so I suggested we revive my old dream. I routed through all my old pictures from my time there in 2009.... Marcin had ten days free in this period, so it was a matter of hoping the weather and conditions would both align. We were incredibly lucky with the weather, two weeks of clear skies, cold enough and no snow. "I arrived in Interlaken at midnight November 28," Ballard continued. "Marcin met me off the train (he had driven from Poland) and we drove to the only free parking in Grindelwald and a discreet bivy. The following morning, we sorted and packed the gear then caught the train to Alpiglen. Now we had two haulbags and four rucksacks to lug up the two-hour approach. We slept at the very base of the wall. [The next day], after an interesting 60-meter pitch of pure rock, we had 200 meters of 'easy' terrain until a long and enjoyable pure ice pitch. Then we set up the portaledge at the base of the First Pillar. Here we slept two nights whilst we climbed up very steep terrain with initially very loose rock (Marcin's A3 pitch), which improved for some passages of free climbing. The third day I climbed a great mixed pitch (M5) to reach easy snow/mixed leading to the base of the Second Pillar (the second pillar extends from the face, so we...went immediately to the Third Pillar). Here is a safe place to bivy (the first people to bivy there were the Polish climbers in 1968) and so we spent two nights in our old creaky portaledge. We moved right to the base of the Third Pillar, a soaring 400-meter wall! Two pitches of mostly solid rock, aid and free climbing (both pitches would make great free climbing) led to a twisted weakness we had seen from my old photos. Sadly the rock turned bad, large blocks and flakes poised to topple—extreme care was needed. Two pitches of mostly free climbing (a bit mixed with some snow as well) [took us] to our final bivy site. We had intended to carry on direct up a huge corner system, but we had had enough of bad rock, so after two diagonal rope lengths we joined my 2009 route Seven Pillars of Wisdom. The rock was now fantastic, but required free climbing between the bolts. The sloping and slabby nature of the rock meant it was quite sketchy climbing in full winter boots. Five pitches and the top of the Third Pillar [was] reached. The following morning we set off early and climbed mixed ground leading to the easier-angled Lauperschild, this is the upper section of the Lauper Route, a climb [that] comes into condition far less frequently than the 1938 Route. The rock is poor [and] the ice was hard and brittle. Eventually we veered left to reach the tantalizingly close Mittellegi Ridge [D: 5.4, 600m], where we were warmed by the sun for the first time in seven days. We cached our gear and followed the mostly snowy ridge to the summit, reaching it around 2 p.m. on December 6. Retracing our steps back to our gear, we then rappelled directly down in 18 full-rope lengths. The rock was mostly bad, one old bolt we had used on the ascent pulled out (we hand drilled four 8mm bolts of our own). We left pegs, wires, cams and even ice screws. It was a long descent with stuck ropes [that] almost turned into an epic. At 8:30 p.m. we slipped into our sleeping bags, tired but content. The next day we packed up and rappelled down Seven Pillars of Wisdom. Then we dragged the 'pigs' [haulbags] down to Alpiglen and the train. We spent that night in a hotel in Interlaken. "The story doesn't finish there," Ballard said. "We had finished two days early, and I had already booked my return train ticket, but because of the French Railway strike I couldn't change it. So we drove back to Grindelwald to take some pictures and then Marcin headed off home and left me there. I bivied two more nights then I too headed away." Tomaszewksi said he and Ballard get along well as partners. "Tom is a representative of the young generation and is focused solely on climbing," he said. "I've got a family, children, job and other responsibilities, which makes my way up to the mountains longer and more challenging in terms of sacrifices and determination. The more so because I live in Szczecin, a city in northern Poland, 500 kilometers away from the nearest crag and 700 kilometers away from the nearest mountain range. To be honest, I can see my younger self in Tom. I also used to be a man of few words, an introvert with his mind only on the goal ahead. I can identify with such traits and this is why we climb and keep silent well together. We do not talk much. It all happens based on our mutual understanding and ability to sense the energy around us." Evidently, Ballard wasn't about to slow down in the aftermath of Titanic. As we were posting this story, he returned to Italy and put up a new mixed route, solo, in Val di Fassa that he called Dust in the Wind (M8 100m). Days later he casually soloed the Gogna Route (5.10, 800m) on Marmolada Punta Rocca (3309m), with about 10 hours of climbing over a two-day span. Click here for the story.